Motorcycle tire testing is getting easier thanks to Alfamation’s latest X-Raptor system, which has been optimised for MCR tires. 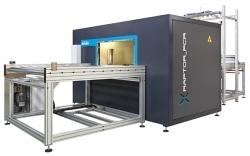 The machine can automatically detect anomalies including incorrect belt alignment/centring/width, incorrect strip/cord angle or spacing, strip/cord waving and foreign bodies. It can automatically load, unload and rotate tires, making inspection fast and easy. For maximum accuracy, the system features automatic spatial calibration capabilities and a new X-Ray detector tailored for the specific tire range, to optimise the image definition. Additional benefits include the X-Raptor’s compact footprint, low energy consumption and optional inlet conveyor with automated tire centring and measurements, automated barcode reader for tire tracking, motorised outlet conveyor and tire marking system. Finally, the automated defect recognition software can analyse each tire and automatically make a pass/fail decision. In semi-automatic mode, the anomalies in all tire zones are shown to the operator.